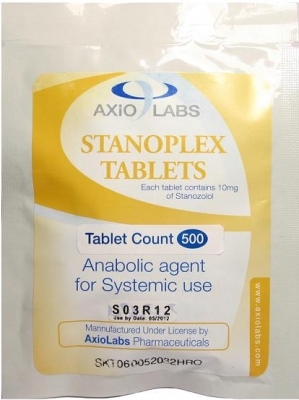 Stanoplex 10 by Axiolabs is an anabolic steroid that contains an active substance named Stanozolol. It is commercialized in a pouch of 100 tabs, each tab contain 10mg/tab of hormone. Stanoplex 10 is popular between bodybuilders and is derivative of dihydrotestosterone. It is also known as Winstrol Depot. Being high anabolic steroid is characterized with low androgenic proprieties. Winstol do not aromatize and seldom produce water retention. It is also relatively toxic to the liver. This steroid stimulates the anabolic process and inhibits the catabolic once produced by the corticosteroids. A lot of athletes like to take this steroid because it help in fast muscle grow. Another thing that makes it loved by bodybuilders is that it improves the tissues nutrition and help depositing the calcium in the bones. Winstrol Depot is often used in bodybuilding in cutting cycle. At the final phase of cutting cycle it is good to combine it with a non-aromatizing androgen such as Trenbolone or Halotestin. An efficient dose for men is 50-100 mg/day. It is recommended should be taken no more than 48 hours apart, with some users preferring to inject every day, or even twice a day, to maintain serum levels. Female athletes are not really advised to take this steroid because they can notice virility symptoms, inhibition of the ovary function, disorders of menstrual cycle. Other side effects that can appear are: gynecomastia, deepening of the voice, male pattern baldness, acne, hormonal disorders. Diabetic patients, hepatic, renal or cardiac insufficiency people are advised to be careful and see the doctor before taking the decision to start taking it.